Prime Minister Gordon Brown is leading tributes to reality TV star Jade Goody who has died of cancer at 27, praising her as a "courageous woman". 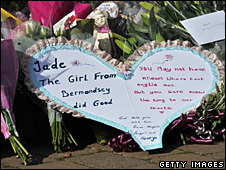 Goody died at home with her family in Upshire, Essex, in the early hours of Sunday after a high-profile battle with cervical cancer. Floral tributes at the mother-of-two's house have been steadily mounting since news of her death broke. The prime minister said he was "deeply saddened" by the news. Goody's mother Jackiey Budden, who was at her side as she died, said: "My beautiful daughter is at peace. Family and friends would like privacy at last." Details of the star's funeral have yet to be finalised but Goody's publicist Max Clifford said it was likely to be a "celebration" of her life. Her cortege is likely to process through Loughton - near her home - after a church service, he said. Jeff Brazier, father of Goody's two sons Bobby, five, and Freddy, four said he was "grateful the boys were able to say their goodbyes and spend that precious time with their wonderful mother". Goody's illness had featured in the media on a daily basis and she allowed digital channel Living to continue following her treatment as well as documenting her wedding to partner Jack Tweed a month before her death. OK! magazine also paid a reported £700,000 to cover the event. Writing on the mini-blog website Twitter, Stephen Fry said she was "a kind of Princess D from the wrong side of the tracks". The pair met while guests on Jonathan Ross' BBC chat show. Fry said: "Poor, dear Jade... I warmed to her immensely. All impulsive spirit and smiles. What a life. "Jade lived life under a magnifying glass. Magnifying glasses magnify (obviously) but they distort and they burn." Former dental nurse Goody, who shot to fame in the 2002 edition of Big Brother, felt the double-edged sword of fame when she appeared again, this time on Celebrity Big Brother in 2007. She was accused of being racist after several heated rows with Bollywood actress Shilpa Shetty. Racing commentator John McCririck, a former Celebrity Big Brother contestant, said: "She brought out one of the most serious problems in this country, the inherent racism... that people try and keep quiet. "It's about people who don't know they are racist but when they're losing an argument with somebody who's Asian or a black person they go back to the old stereotypes, and she did that." Goody later said she was "embarrassed and disgusted" by her own behaviour. Fellow contestant Cleo Rocos described how "she lived every second to its fullest exploding point" and said Goody took the highs and lows of her fast track to fame in her stride: "In a way, when she was criticised, you were criticising her directly, because she wasn't phoney, she never put up a pretence. "She was Jade Goody, like it or lump it, that was her." Goody and Shetty were later reunited on the Indian version of the show, Bigg Boss. It was on that programme that Goody learnt of her illness. In a statement from Mumbai, Shetty said: "I am deeply saddened by the news but in hindsight glad she is out of pain and passed away peacefully in her sleep."